Futurist Assessment on human competitive advantage over A.I. “Innovation Driven Leadership” from disruption to SDG. Human Enhancement Knowledge, Skills & Tools. Why human enhancement would ensure jobs at the 4th Industrial Revolution Age ? The human skills that A.I. can not replace. The Matrix-Q Human Enhancement Program : New jobs for new kind of humans. Human Competitive Advantage over A.I. along the 4th Industrial Revolution & SDG2030. (Leadership skills, knowledge, tools, technology and standard). 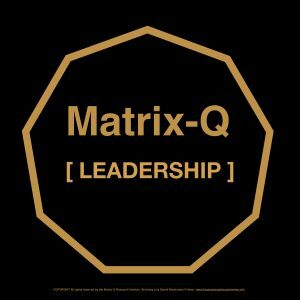 The Matrix-Q Leadership Training Program. Innovation Driven Leadership : from disruption to SDG. The Matrix-Q Human Evolution Time Line: human skills, stages of development, leadership styles and archetypes, innovation driven leadership and SDG. A.I. & Jobs Displacement for 2030, Human Capital Value & Soft Skills. Please choose any of following alternatives and contact us for schedule. Gamified Presentation, Learning by serious playing: 45′- 90′ min. Luis Daniel Maldonado Fonken. Founder & Research Lead of the Matrix-Q Research Institute. Consultant, Trainer, Author. Matrix-Q Leadership is a consultancy and training service of the HUMAN ENHANCEMENT program provided by the Matrix-Q Research Institute. The Matrix-Q Human Enhancement Program, focus on supporting leaders advance their effectiveness and reduce their global sustainable development footprint. Human enhancement program utilizes knowledge on human stages of development, human potential, self-management, self-knowledge, innovation driven leadership and education methodologies applied for human effectiveness. Leadership is the ability to “lead” or guide oneself, other individuals, teams, entire organizations, communities or nations. Leadership is a skill necessary for everybody: entrepreneurs, researchers, educators, innovators, householders, parents, students, city or government leaders, children, public servants, artists and others. Systemic leadership is the ability to enhance collective intelligence and lead sustainable growth through application of leadership practices and knowledge. Innovation driven leadership is the ability to utilize innovation skills like emotional intelligence, perception, flexibility, adaptability, creativity, multidisciplinary insight, for leading organizations and networks towards systemic collective intelligence and sustainable growth. Matrix-Q Human Enhancement Knowledge, Tools, Skills, Technology, Standard, Education Program & Consultancy Service are innovations of Luis Daniel Maldonado Fonken (Matrix-Q Standard www.standard.matrix-q.com ). Licenses are provided for commercial and non commercial use.